Toots Hibbert is one of the great voices of Jamaica; a legend whose career spans every development in Jamaican music, from ska through rock-steady to reggae. 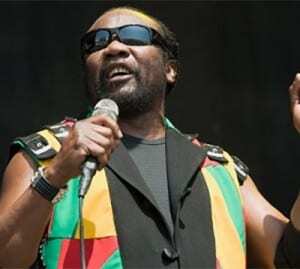 Toots and the Maytals have helped to chart the course of Jamaican music with unrivaled delivery and dynamism, setting new standards of excellence, and becoming the most enduring of all Jamaica’s groups. Born in Maypen in the parish of Clarendon, Jamaica – the youngest of seven children – Toots began singing in the church choir at the age of seven. He left home in his teens to go to Kingston where he met Raleigh Gordon and Jerry Matthias and formed the original Maytals in 1962. They were also sometimes recorded as the Vikings. The Maytals began their career at Studio One, the headquarters of Clement ‘Coxsone’ Dodd, in Kingston, Jamaica. The group’s debut release, HALLELUJAH, was an immediate hit throughout the island, and featured a mix of Jamaican rhythms and gospel vocal influence that would mark much of the Maytals music. Further successes followed, including I’LL NEVER GROW OLD and JUST GOT TO BE ME, each one building a reputation for the Maytals and their energetic straight-from-church style of singing and their “spiritual” ska beat. Despite the initial successes, the group soon left Coxsone and linked up with another legendary figure in the Jamaican music business, Prince Buster, the number one sound system operator on the island. The Buster-produced Maytals singles were popular successes in Jamaica and England, where this new type of “ska” music became a sensation in dancehalls. The relationship between Buster and The Maytals produced some of the best records from the original ska era, including DOG WAR, aka BROADWAY JUNGLE. In 1966, the Maytals began to work with Byron Lee and the Dragonaires and won the first Jamaican Festival Song Competition with the song BAM BAM. The Maytals were poised for stardom, but just as their fortune seemed set, Toots was arrested for possession of marijuana and was incarcerated for 18 months, despite his plea of innocence. The Maytals returned with a vengeance in 1968, recording with famed producer Leslie Kong. The era of ska was ending, giving way to the more complex sounds of Reggae evolving from Kong’s Beverleys Label. Although these years of post-independence marked a more violent era of Jamaica’s history, Toots and the Maytals were far closer to soul and gospel influences than many of the “revolutionary” young artistes of the late 60’s. Nevertheless, the Maytals first single in two years, 54-46 (THAT’S MY NUMBER), combined the story of Toots’ arrest with a powerful downbeat to create one of the greatest rock steady/reggae singles of all time. As rock steady became reggae (and the Maytals single DO THE REGGAY was the first published use of the word), the Maytals consolidated their position as leaders in Jamaican music. They recorded the hit MONKEY MAN and the classic SWEET AND DANDY which won the 1969 Festival Song Competition and was featured, along with their dance-floor smash, PRESSURE DROP, on the soundtrack to THE HARDER THEY COME, one of the great reggae albums of all time. The Beverley’s label folded, however, with the passing of Leslie Kong in 1971. The Maytals turned again to Byron Lee and his Dynamic Sounds, and again won the Festival Song prize in 1972 for POMP AND PRIDE. They released their first album for Dynamic, FUNKY KINGSTON in 1973– a masterful album in every respect and one that helped bolster the group’s international audience- now considered a classic staple for any reggae collection. In 1975 Toots and the Maytals signed a worldwide recording contract with Island Records. The following year the group hit the British singles charts with REGGAE GOT SOUL, the title track to their new album. They also toured America, Europe and Britain. The REGGAE GOT SOUL album was a superb showcase for Toots’ soulful vocals embellished by fine musicianship from a cosmopolitan studio band that included such talents as Steve Winwood, Eddie Quansah, Dudu Pukwana, Rico Rodriguez and Tommy McCook. Constant touring showed audiences what Jamaicans had known for over a decade – that Toots and the Maytals were simply one of the greatest live acts in the world. Their popularity increased throughout the 70’s with such popular releases as PASS THE PIPE (1978), IN THE DARK (1979), JUST LIKE THAT (1980), KNOCK OUT (1982). IN THE DARK, which included the songs TIME TOUGH and TAKE ME HOME COUNTRY ROADS was internationally acclaimed, and BEAUTIFUL WOMAN from the KNOCKOUT album was an international hit. The world’s audiences were able to hear Toots and the Maytals fuse reggae, soul, gospel and even country, into a dynamic original combination. On September 29, 1980, Toots and The Maytals made history when the band played at London’s Hammersmith Palais. Less than 24 hours later, a live album from that show was on sale in record stores throughout Britain. It was the fastest live album in recording history and, according to some critics, TOOTS LIVE ranks alongside Bob Marley Live At The Lyceum, James Brown At The Apollo and Otis Redding in Europe as one of the finest live records ever made. After disbanding the Maytals in the early 80’s, Toots began recording with Sly Dunbar and Robbie Shakespeare. The combination produced SPIRITUAL HEALING — a chart success around the world, even reaching number one in South Africa and another hit, PEACE PERFECT PEACE. The popular and critically acclaimed TOOTS IN MEMPHIS (1988) followed, featuring Toots covering Stax classics in his own inimitable way. Toots reformed the Maytals and picked up the touring pace again in the early 90’s. The group released RECOUP (1997), and the Grammy-nominated SKAFATHER (1998) – featuring new re-cuts of older material with a few new tracks included. Toots and the Maytals have been nominated three times for Grammy Awards – the other nominations were for TOOTS IN MEMPHIS and TOOTS LIVE. The Maytals also hold the record for the largest number of number one hits in Jamaica, with 31 to their credit. They are the only Jamaican group that has both sides of one of their records become number one on both Hit Parades (DADDY and IT’S YOU). The 2002 release, WORLD IS TURNING, on Toots’ own D & F label, was the first album of all new material to be released in two decades. The album contains songs that were works in progress over a long period between 1973 and 2002, and features refreshing originals with a wide variety of styles and influences, including rocksteady, reggae roots, funky r&b, rave disco, and gospel. The 15-song album includes only one re-cut, a hot new version of the roots-reggae FEEL FREE, with a brilliant cameo from the Messenger, Luciano. The latest album, TRUE LOVE, finds Toots and the Maytals revisiting some of the band’s most classic works with a host of musical friends onboard – Keith Richards, Shaggy and Rahzel, Bonnie Raitt, Jeff Beck, Ben Harper, No Doubt, Marcia Griffiths, Ken Boothe, Ryan Adams, Bootsy Collins and the Roots, Eric Clapton, Jeff Beck, Terry Hall and the Skatalites and Trey Anastasio – for delightful fresh-ear journey through Toots’ musical history. Add in the surprise tracks- Willie Nelson and Toots groovin’ on Willie’s STILL IS STILL MOVIN TO ME, Rachel Yamagata pleading on the newer BLAME ON ME and Bunny Wailer’s vocal comradery on the never-before released TAKE A TRIP for an unparalleled reggae joy ride.